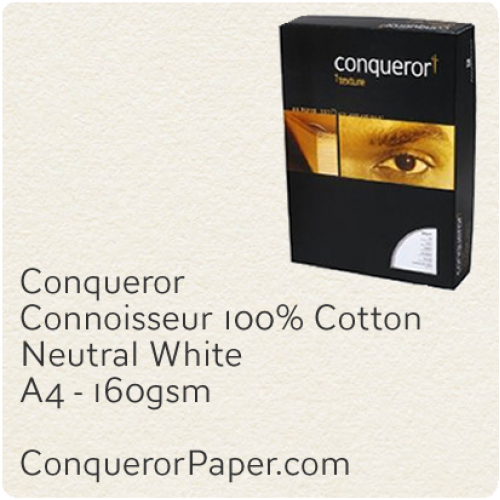 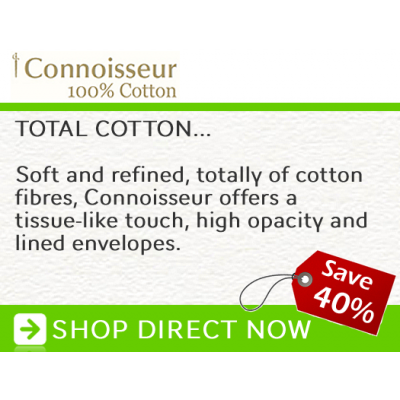 Conqueror Connoisseur is the ultimate business communications paper having 100% cotton content with tissue lined envelopes. The benchmark for luxury and quality is this premium business stationary product with matching Conqueror Connoisseur paper and envelopes for the ultimate expression of the keenest attention to every detail. 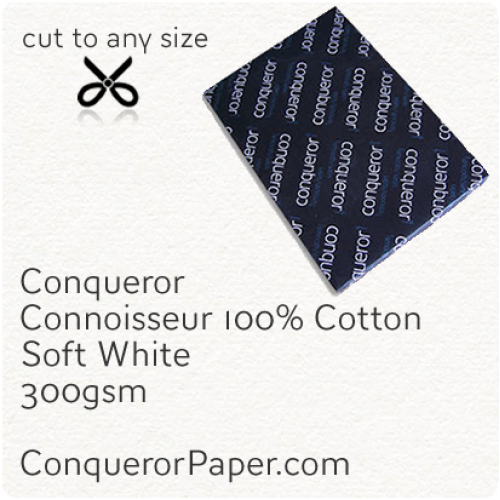 Buy here today and earn Reward Points towards your next purchase. 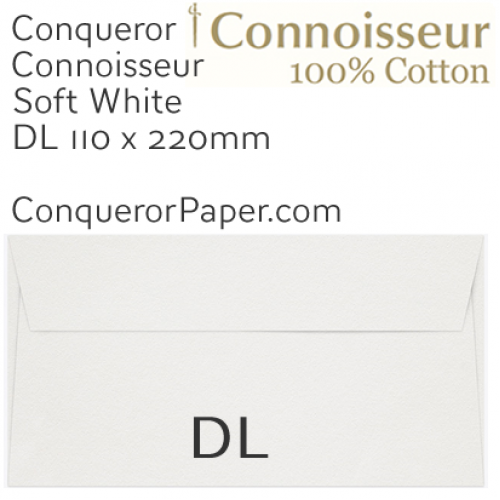 Prestige Envelope Brand CONQUEROR WINDOW = No SIZE = C5 162 x 229mm TYPE = Wallet (flap on long edge) FLAP = Super Seal (Peel and Seal) C..
Prestige Envelope Brand CONQUEROR WINDOW = No SIZE = DL 110 x 220mm TYPE = Wallet (flap on long edge) FLAP = Super Seal (Peel and Seal) C..
Prestige Brand CONQUEROR Paper High Quality TINT: Soft White FINISH: Connoisseur PAPER: 110 gsm SIZE: A4 - 210 ..
Prestige Brand CONQUEROR Paper High Quality TINT: Soft White FINISH: Connoisseur PAPER: 160 gsm SIZE: A4 - 210 x 297m..
Prestige Brand CONQUEROR Paper High Quality TINT: Soft White FINISH: Connoisseur PAPER: 300 gsm SIZE: A4 - 210 x 297m..
Prestige Brand CONQUEROR Paper High Quality TINT: Soft White FINISH: Connoisseur PAPER: 110 gsm SIZE: SRA2 - 45..
Prestige Brand CONQUEROR Paper High Quality TINT: Soft White FINISH: Connoisseur PAPER: 160 gsm SIZE: B1 - 700x..
Prestige Brand CONQUEROR Paper High Quality TINT: Natural White FINISH: Connoisseur PAPER: 110 gsm SIZE: A4 - 2..
Prestige Brand CONQUEROR Paper High Quality TINT: Natural White FINISH: Connoisseur PAPER: 160 gsm SIZE: A4 - 210x297..
Prestige Brand CONQUEROR Paper High Quality TINT: Natural White FINISH: Connoisseur PAPER: 300 gsm SIZE: A4 - 210x297..
Prestige Brand CONQUEROR Paper High Quality TINT: Soft White FINISH: Connoisseur PAPER: 300 gsm SIZE: SRA2 - 45..
Prestige Brand CONQUEROR Paper High Quality TINT: Soft White FINISH: Connoisseur PAPER: 300 gsm SIZE: B1 - 700x..
Prestige Brand CONQUEROR Paper High Quality TINT: Natural White FINISH: Connoisseur PAPER: 110 gsm SIZE: SRA2 -..
Prestige Brand CONQUEROR Paper High Quality TINT: Neutral White FINISH: Connoisseur PAPER: 160 gsm SIZE: B1 - 7..
Prestige Brand CONQUEROR Paper High Quality TINT: Neutral White FINISH: Connoisseur PAPER: 300 gsm SIZE: SRA2 -..